The travel agency Averoja has been founded in 1996 and is a full service travel bureau that provides all necessary tourism information and services. From the date of the enlargement of the company in 2001 Averoja provides organisation of conferences and workshops. In 2003 Averoja established corporate clients’ department that provides full travel services all around the world to corporate clients on a basis of a contract. Since 2008 Averoja is an official sales agent in Latvia of the largest tour operator in Germany, Austria and Switzerland “FTI Touristik” (Frosch Touristik GmbH), providing charter flights to the most popular resorts all over the world. Averoja is a founder and a member of the bus tour operator group “ATG” and since 2004 organises bus tours in the Baltics and Europe. 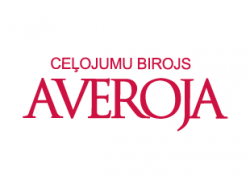 Averoja has incoming tourism department. Currently it is developing cooperation with markets in Russia and Belorussia. Averoja is a member of Association of Latvian Travel Agents (ALTA) and The International Air Transport Association (IATA), and the company is registered in the Database of Tourism Agents and Tourism Operators of the Ministry of Economics (TATO) and has the financial guarantees of customers’ money.